The portfolio “Technical Fowls & Birds of Prey” is a Perpetual Bond™ with a domain that we have restricted (arbitrarily) to just the noisy (in the news) consumer “high tech and high flyers” such as Microsoft, Apple, Google, Amazon, Yahoo! and a few others, and, in contradistinction, the “Birds of Prey” which are also consumer and retail oriented but “low tech” or service oriented and quiet , that is, seldom touted as the urgent and “Great Buys of the Day and Once In A Lifetime Opportunities”. They’re more notable for just “eating every day” and going about their business rather well. The purchase prices might look “high” now but they’re irrelevant and we’re only concerned about whether they’re (B) and investment grade, or (N) and they’re not, now. The domain, then, has just eighteen companies of the hundreds of companies that we routinely consider for investment opportunities. The first eleven (please see Exhibit 2 below) are deemed high tech and “Technical Fowls” and the remaining seven, “Birds of Prey”, although there are more than a dozen of them in the major North American markets (and could be the subject of an upcoming Post from RiskWerk). The portfolio domain is managed in the usual way using our (B)(N)™ technologies and the Cash Flow Statement (Exhibit 1 below) shows that we were able to buy just ten of them in early January (Count Line) for a cash outlay of $317,000 (Portfolio Line) buying blocks of 1,000 shares in each of the eligible companies (labelled (B) in Exhibit 2) regardless of the stock price at the time. The portfolio return (Total Line) is +38% plus dividends of about 2% to mid-September in contrast to an index return (Index Line) of +16% in the S&P 500 Composite Index of which AAPL Apple Computer Inc at +60% (CHG Column in Exhibit 2) is itself about 5% of the $11 trillion market and the remaining ten “Technical Fowls” add another 10%. If we had bought all eighteen of the companies in early January, then the cash outlay would have been $1,683,000 and the return (Companies Line) +25% plus more dividends for the year-to-date. Neither portfolio was ever worth less than the money that we put in but, after all, if we had $1,683,000 to invest we could have bought five times as much of the Perpetual Bond™ which guarantees capital safety. One notices that, despite all the media noise, we bought almost none of the “Technical Fowls” this year (marked (N) in Exhibit 2), the exceptions being IBM, Intel (in which we recently sold our interest), Honeywell and a recently renewed interest in Apple (with caution). We didn’t buy, for example, AMZN Amazon.com Inc which has had a +34% price gain so far this year. 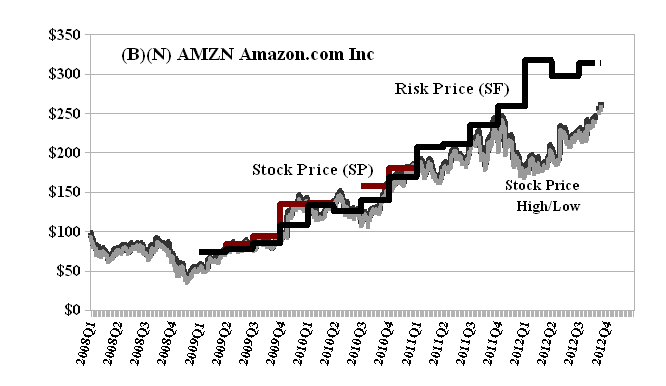 Amazon, of course, is a great and very innovative company with a market capitalization of over $115 billion, total assets of $21 billion, shareholders equity of $7.5 billion and annual sales of more than $50 billion coming from next to nothing just ten years ago, but the Risk Price (SF) (Black Line, a step-function) now remains stubbornly above the Stock Price (SP) (Red Line, where shown in earlier periods) and because of our steadfast policy of risk aversion, we won’t be able to buy it until either the stock price increases and exceeds the risk price (B) or the risk price declines below the stock price (also (B) with caution attached). If the market were entirely dominated by volatility, as supposed by volatility-based models such the Capital Assets Pricing Model (CAPM) and groundless doctrines such as “mean reversion”, we would have nothing to buy and everything would almost always be trading in (N). But that is not the case. Investors don’t “buy” volatility and a hopeful return to the “mean” – they buy in order to invest their money safely and obtain a hopeful return above the rate of inflation and, believe it or not, that’s rather easy to do. The Birds of Prey all provide examples of how really easy that is. 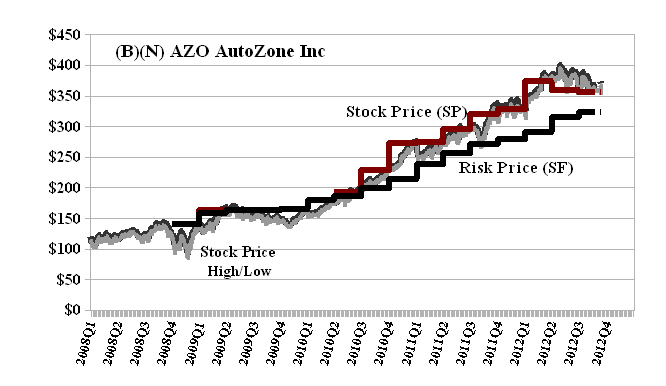 The daily stock price and volatility (high/low) is shown as the Dark Line and grey zone below it. 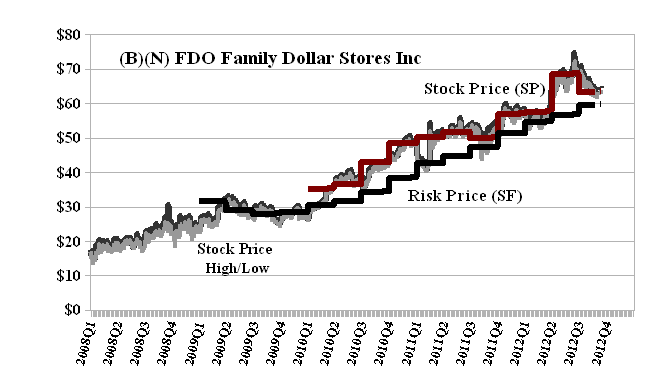 The Risk Price (SF) is the Black Line which is a step-function because it is calculated from the generally available balance sheets of the company and has nothing to do with the actual stock prices. It is new information. The Stock Price (SP) is the Red Line and is also a step-function which shows the nominal prices at which we were able to “buy”, hold or “sell” the stock using our usual methods of risk aversion. Please see, for example, The Wall Street Put, August 2012.